iPhone users whose devices have been stolen may soon get a little help from Apple when it comes to the problem of iMessages going to the pilfered phone. Ars has heard that Apple may be planning changes to the way iMessages are handled that will make it simpler for users to lock out unauthorized devices, though it's unclear when that might happen. In the meantime, some users are finding that there are some temporary "fixes" to the problem of iMessages going to stolen phones. Ars covered this phenomenon last week when Ars reader David Hovis contacted us to tell us his wife's tale of woe. To recap: Mrs. Hovis' iPhone 4S was stolen, so she remotely wiped the device and then asked her carrier to deactivate the SIM. She then purchased a new iPhone and activated it with her old number—theoretically erasing all traces of her information from the original stolen phone. But when Hovis began sending iMessages to his wife, both she and the new owner of the stolen phone received them—Hovis and the new owner had a somewhat lengthy dialogue back and forth about the issue in order to confirm, and the new owner (who had allegedly purchased the stolen device from someone for $500) seemed just as perplexed as Hovis. Several threads posted online recounted similar horror stories, and after publishing our piece, we received e-mails from a number of other affected users. One user who contacted us was deeply concerned that someone she knew as a stalker might have stolen her iPhone, and that all iMessages directed at her (on a new phone) were also going to the stalker. 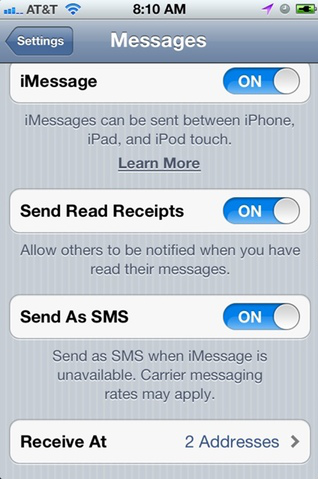 Clearly, this can turn into a major concern for some iPhone users. Macworld can confirm that perhaps the easiest way to ensure that a stolen phone stops receiving iMessages is to remotely wipe the phone, and then call your carrier and instruct them to deactivate your old SIM. The third and final step? Activate a new SIM in your new phone. Completing those three steps—wiping, deactivating your old SIM, and then activating a new one—ensures that your iMessages will get sent only to you and your iOS devices, and not anywhere else. We were unable to test this ourselves, so we're taking Macworld at their word—I spoke with the author of the piece, Lex Friedman, who told me he tested it personally with success. I went back to speak with Hovis with this article in hand, however, and he told me that he performed those same steps in the same order without success—the messages still went through to the owner of the stolen phone. Our only guess is that Apple has already made some changes to iMessage on the server side between the time Hovis performed his remote wipe and the time Friedman performed his remote wipe, but this remains unconfirmed. There is another, slightly more complicated process that will also work to lock out stolen iPhones from your iMessages, but be warned: it could also block you from finding the phone via Find My iPhone if the thief reboots your phone. You can set a PIN on your SIM card, which is different than setting a PIN for the phone. The reason this is a less-ideal solution isn't just because it's more complicated—it's also because each carrier already has a default PIN set for your SIM card, and you risk locking yourself out from your own account if you don't do this correctly. Still, our sources tell us that performing the aforementioned three-step process (remote wipe, deactivation, then activation on a new SIM) should work from this point on to lock out a stolen iPhone. So if you find yourself having some bad luck with thieves, it's worth trying that method before trying to set a PIN on your SIM card. We'll keep you updated if and when we hear anything new about this issue, and please keep e-mailing me with your stories and observations about iMessage.